The network has pulled episodes of "The Dukes of Hazzard" from its schedule, a spokesperson for TV Land confirmed on Wednesday. 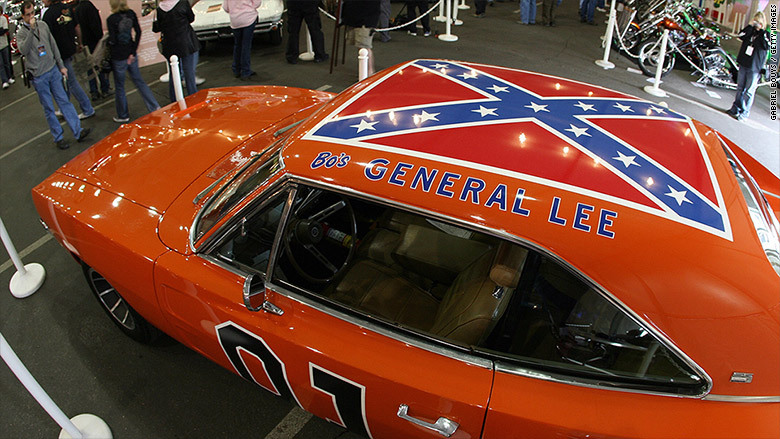 The network would not comment further on whether reruns of the series were pulled due to its inclusion of a 1969 Dodge Charger known as the "General Lee" which has the Confederate battle flag painted on its roof. John Schneider, who plays Bo, made his displeasure with the decision clear in a tweet that included a picture of alleged Charleston, South Carolina, murderer Dylann Roof burning an American flag while wearing a Gold's Gym T-shirt. Schneider wrote: "I am grossly offended by flag burning. But...is the Gold's Gym logo to be considered a symbol of racism as well now?" In the wake of the murders at the Emanuel African Methodist Episcopal Church in Charleston, the flag has become a major point of contention. Since the "General Lee" is one of the most famous cars in TV history the series has been added to that argument. The show (which is distributed by Warner Bros., a unit of Time Warner (TWX) like CNN) ran during the early 1980s and has gained a solid cult fan base. TV Land, which is owned by Viacom (VIA), pulling the series comes a week after Warner Bros. consumer products said that it would stop licensing General Lee toy cars and models. "I think all of Hazzard Nation understands that the Confederate Battle flag is the symbol that represents the indomitable spirit of independence which keeps us 'makin' our way the only way we know how,'" Jones wrote on his Facebook echoing the series' theme song. "I will fight these people until hell freezes over," Jones wrote. "And then I will fight them on the ice."